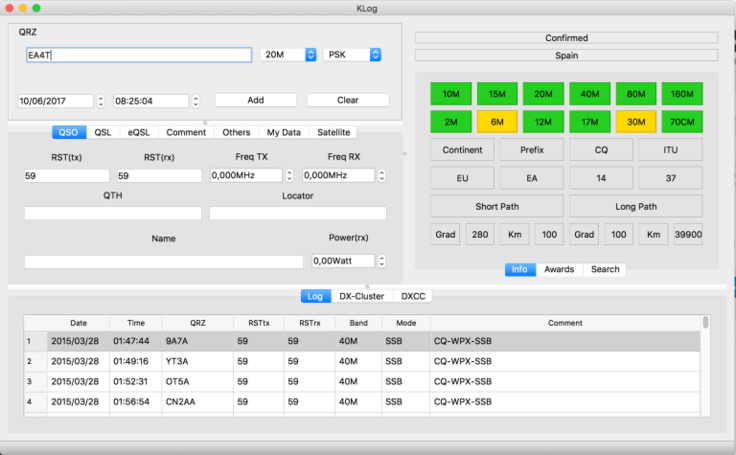 KLog is the only hamradio logging program that can be executed in several operating systems! KLog has many features that will help you to manage your radio activity. - eQSL, LoTW management (still not fully integrated). - DX-Cluster client that will show you the status (worked, needed…) of each spot. - DXCC status per band. - ADIF import and export. - DX Marathon basic support. This discussion is only about KLog and the KLog package. If you have feedback for Chocolatey, please contact the google group. Tell us what you love about the package or KLog, or tell us what needs improvement. Deployed from e27d7a207f. You are on web.2. UTC time is currently 20 Apr 2019 01:26:59 +00:00.